Home » Uncategorized » Scholarship season is off to a great start. The first wave in our longstanding commitment to youth scholarships got off to a great start as we received 38 applications from area students for our Elks National Foundation Most Valuable Student Scholarships. 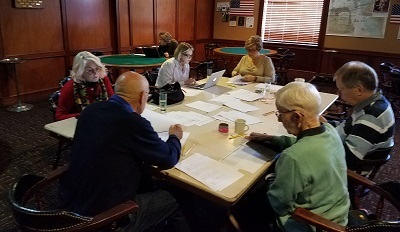 Our Scholarship Committee spend the afternoon grading applications from area students from Alameda, Oakland, Berkeley, San Leandro, Hayward and even Fremont! The Scholarship Committee also reminds all Elks members that the deadline for the Annual Alameda Lodge Scholarships is March 31st, 2018. Scholarships are open to the children and grandchildren of Alameda Elks members who are seniors in high school and planning to attend a four year college. Read more about the program and download your application here. Our scholarship programs are here to benefit your children and grandchildren. Take advantage of them!